What is the Public Services Card? 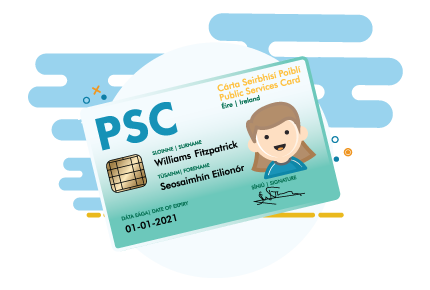 The Public Services Card establishes and fully authenticates your identity, assisting you in accessing a range of public services in an easy and safe manner. Your identity is fully authenticated when it is issued so you do not have to give the same information to multiple organisations. The card was first introduced in 2011 for social welfare payments and is now being rolled out to other public services. The front of the card holds a person’s name, photograph and signature, along with the card expiry date. The back of the card holds the person’s PPS number and a card number. It also holds a magnetic stripe to enable social welfare payments such as pensions to be collected at post offices. If you are entitled to free travel, the card will also display this information in the top left-hand corner. If FT-P is written on the card the holder is personally entitled to free travel. If FT+S is written on the card the holder can travel with their spouse, partner or cohabitant. If FT+C is written on the card the holder can have a companion (over 16) travel with them for free.